Grove Press, Black Cat, 9780802170811, 392pp. Ismet Prcic's brilliant, provocative, and propulsively energetic debut is about a young Bosnian, also named Ismet Prcic, who has fled his war-torn homeland and is now struggling to reconcile his past with his present life in California. He is advised that in order to make peace with the corrosive guilt he harbors over leaving behind his family behind, he must "write everything." The result is a great rattlebag of memories, confessions, and fictions: sweetly humorous recollections of Ismet's childhood in Tuzla appear alongside anguished letters to his mother about the challenges of life in this new world. As Ismet's foothold in the present falls away, his writings are further complicated by stories from the point of view of another young man--real or imagined--named Mustafa, who joined a troop of elite soldiers and stayed in Bosnia to fight. When Mustafa's story begins to overshadow Ismet's new-world identity, the reader is charged with piecing together the fragments of a life that has become eerily unrecognizable, even to the one living it. Shards is a thrilling read--a harrowing war story, a stunningly inventive coming of age, and a heartbreaking saga of a splintered family. "Impressive . . . Inventive . . . Pushes against convention, logic, chronology . . . Ambitious and deep . . . [Prcic] succeeds at writing an unsettling and powerful novel." "Fierce, funny and real, it also says much about war, exile, guilt and fear." "Prcic captures the insanity of war and its unceasing aftermath." "A playful but heartfelt debut . . . Brightly detailed . . . [Prcic is] a spirited, soulful talent." "Brilliant . . . With verbal glee, Prcic serves up a darkly comic vision of the terrors and misunderstandings of immigration. Tight, glorious little tales-within-tales abound, rattled off with a quick, artless naturalism. . . . The writing is packed with one original metaphor after another, language that's almost drunk with colorful, startling images. . . . Brimming with scraps of memory, regrets, and rationalizations, Shards leaves an indelible scar on the reader's imagination. Prcic has pieced together a young man's story from the torn and exploded remains of his former life, and the sheer power of his language leaves the reader shaken." "The experience of reading Shardsthe deliberate disorientation, the layering and morphing of events that characterize the bookreveals in a more visceral way what it might be like to live always with a full awareness of the tenuousness of civil society, of the terrible precariousness of calm." "Compelling, sensual detail . . . Prcic’s prose is effective both at delineating the psychological nuances of his characters, and the sometimes-dodgy circumstances of the outside world. . . . There is a strain of dark humor running throughout, and an elastic joy in storytelling and linguistic expression that prevents this from being a simple recitation of atrocities and pain. . . . Well-written and thought-provoking . . . The story it tells is as unique and individual as the author who penned it." "Experimental and brutal and heart-wrenching . . . You just give in to it, as you do when reading someone like Faulkner. . . . What makes Shards so compelling is, first of all, the language . . . which has an almost ferocious beauty. Secondly, and as important, is the organization of the book, which gives it a sense of urgency. . . . Ismet's confusion is so vivid that it becomes ours, making us participants in this story. . . . To have had such a life when you are so young is hard to convey without becoming sentimental or pathetic, yet Prcic has done it brilliantly." "Innovative in form and startling in its storytelling, Shards is a brilliant debut novel from Ismet Prcic." "Ismet Prcic has taken apart the complexities of war, love, family and home and scattered them across a novel that is as heartbreaking as it is beautiful. Shards is an original work of art, brutal and honest, and absolutely unforgettable." "Ismet Prcic's prose is a gleaming pinball kept in inexhaustible play, kinetically suspended in time and space, endlessly flung away from its inevitable ending, colliding with memory and invention. This is writing fed by skill, inertia, horror, and sorrow, a survivor's story of triumph and guilt. Yet Prcic's sensibility is at once brutally and tenderly comic. Humanity seems to run deepest among those who have survived its near-absence in the world." "A brilliant debut that manages to be both experimental and emotionally resonant. Comparisons to that other Bosnian-American writer, Aleksandar Hemon, will be unavoidable, but Prcic’s work is completely and wholly his own. Shards will come to be seen as the definitive novel of the Bosnian war and its resultant diaspora." "This novel moves at light speed, with shattering immediacy, through the parallel universe lives of two young Bosnian menwho may, in fact, be one person. Like fear, it will make you open your ears." "The reason this novel is so good, hard, beautiful, and disturbing is that there is more than one Ismet delivering the many sharp pieces. Shards feels like a primary document torn from life by a powerful new talent." "A passionate heart beats in these pages devoted to the reassembling of a life sundered by war. 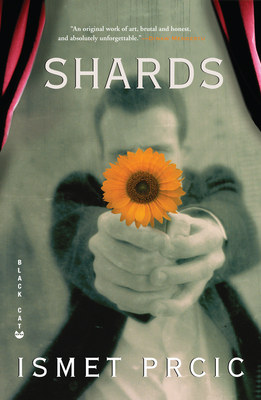 Ismet Prcic’s debut novel Shards is an outsized, outrageous, outstanding performance." "[A] heartbreaking, rude, surprisingly compassionate, and still violent story about a Bosnian refuge who is trying to make sense of his new life in southern California . . . You're not going to find many sentences in any book, anywhere, like the sentences you find here. . . . Prcic makes use of preposterous and somehow dead-on analogies and allusions, profanities and profundities. He celebrates the hieroglyphs of punctuational tics, smears words, elevates typefaces, deploys footnotes, diary entries, memoirisms, blasphemy, theater, treachery, vulgarisms, and it works. . . . This book cannot be explained. It is to be experienced. Sentence by sentence, scene by scene." "I read the book with my mother, we were laughing, we read passages to each other, we said: Look, it’s giving me goose bumps, and then mother was crying quietly, and I thought: What a great book, what it is doing to us!"